In the picture of the circuit,what is the object just below the 100k resistor and right above the diode closest to the output jack? Is that a transistor? oh ok,I see.im gonna try building this one.I cant seem to get my NPN germanium emulation fuzz to work.when it said to match each pair of transistors does that mean matching the hfe? and do i have to make all 4 transistor match exactly the same?Sorry i know i should ask this in the forum,will put my questions there too. just wondering...... how is this pedal any different than a regular big muff? It isn't. It's just a variation on the commonly swapped components like coupling caps and collector resistors. The 100K in the tone stack does mean that stock it is quite flat (well low end boosted slightly) but there's nothing new about it. It does sound very good though and so I'd suggest anyone who does like a collection of muffs to give it a try. 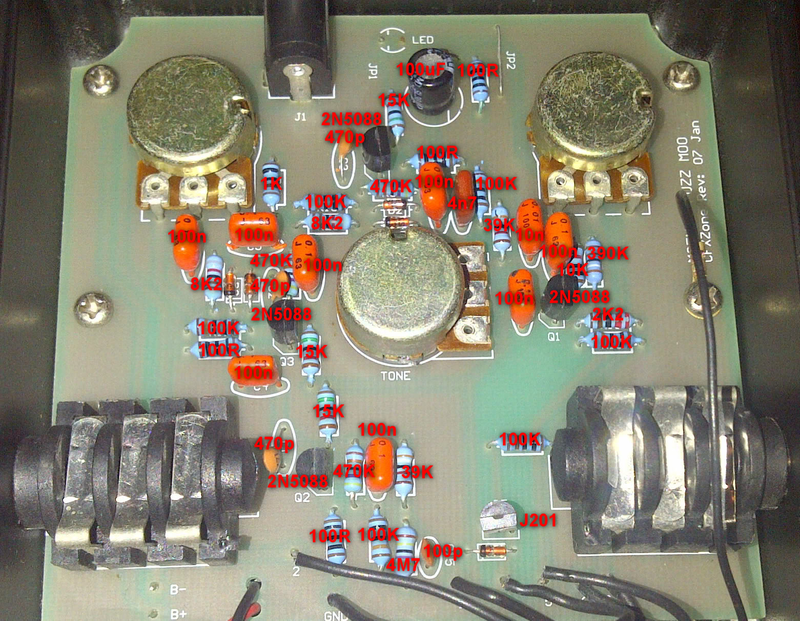 What happened to the J201 fet from the PCB photo, the one on the right by the output socket? that's part of the millennium bypass and doesn't effect the pedal's tone. Just built this and it sounds really good. However it is my first fuzz build so i have nothing to compare it with. I socketed the transistors so i could try a few different types but not sure what to try and what combinations. Any suggestions? Hi Gavin, thanks for verifying. Try any NPN silicon transistor, BC550C, 2N5088, MPSA18 etc etc. I seem to like the muff with higher gain transistors in so I'd probably stay away from lower gain ones personally, but give anything a try and see what you think about it. For diodes there is again lots you can go at. Try germanium like 1N34A, schottky like BAT43, BAT85 etc, and even something like LEDs may work well in there. Oh! i did also socket the diodes so suggestions on some alternatives would also be appreciated. Thanks in advance. I'd like to build this one , I have all needed in hand. Just a stupid general question because I'm new in this hobby, is there a great difference I use ceramic capacitor instead of MKT for nano values ? Thanks ! Built this up for fun with 2N5088s. Holy high gain Batman! If you compare this to some other muffs you'll see some resistor changes (mostly at the emitters, but a few others) that make this thing a high-volume monster. This would be a great one it you want to push an amp hard, but I couldn't get the volume much past just barely on without the level being way too high above unity to be used except as an always on pedal. I'll probably stick a higher value pot on it and call it good, but if you want to mess around with different values in a muff this could be a fun starting point. Dug this one out a year later and replaced the 2k2 from Q4 emitter to ground (R4 on the schem, top left on the layout) with 3k6 to dial down the gain on the recovery stage. Volume is back in a sane range, no change to tone to my ear. 3k3 is the normal value in most muffs and should also be totally fine.